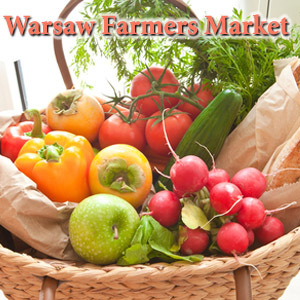 The 2015 Warsaw Farmers’ Market is held at Ralston Park every Thursday from May 28th through September 24th from 3:00 pm until 6:00 pm. There is no cost to sell your Agricultural goods, Arts or Crafts. Our goal is to provide a friendly environment to buy and sell locally produced products. Mission of the Market: It is the mission of the Farmer’s Market at the Ralston Park to establish and maintain a safe, friendly environment providing quality locally grown products produced by local vendors committed to personal relationships and customer satisfaction. Obligations of Park District: The Warsaw Park District will make every effort to promote through local media advertising, posters, banners and press releases. baked and or prepared foods must complete a Cottage Food Operations class held by the Illinois Department of Public Health. Egg producers must have an Illinois egg license. Vendors must remove ineligible products, if requested by the Market Manager. Arts and Crafts: High-quality arts and crafts may be sold. Some craft items for sale may need to be pre-approved by Market management. Booth Space: Space and location are first come first serve. All set up items (tents, chairs, tables, display boards, etc.) are the responsibility of the vendor. Legal Compliance: Vendors are expected to familiarize themselves with local and states laws related to their business and are responsible for compliance. Examples include laws related to health regulations, weights and measures (scales), sales taxes, and insurance. Health Department and other officials may visit the Market to assure compliance with regulations. Signage: Signs boards, tags or labels listing prices of all products for sale must also be posted prior to the beginning of sales. whether a particular sales practice falls within this provision. Vendors must agree to follow the direction of the Market Manager in regard to these practices. Maintain safe, clean conditions in and around the sales area. Maintain a professional and tidy personal appearance. Maintain cordial relations with customers, Market management and other vendors. Clean up: Vendors are responsible for cleaning all trash and waste within and around their allotted space before leaving the Market each week. Location: the Market will be located at Ralston Park along the 4th Street (East) side of the park. There is no alternative location in the event of rain, so vendors should come to the Market prepared for any adverse weather. A tent or canopy is recommended but should be properly anchored with weights (not stakes) in case of windy conditions. Hold Harmless Clause: the Participant agrees to indemnify and save the Warsaw Park District harmless from and against all claims, loss, damage, injury and liability however caused, resulting from, arising out of, or in any way connected with the operation of The Farmer’s Market at the Ralston Park, or by any negligence or alleged negligence on the part of any of the Participant’s agents or employees. You may also contact the Park District by email. © 2019 Warsaw Park District. All Rights Reserved.